City or village of priests where David received holy bread when in pressing need of food at the beginning of his persecution by Saul (I Sam. xxi. 1-9), for which nearly the whole community was put to death. It is also referred to by Isaiah as the latest stage in the imaginary march of an Assyrian king (probably Sennacherib) moving southward against Jerusalem. In Neh. xi. 32 it is mentioned along with Anathoth (as also in Isaiah), among a number of towns of the Benjamites. 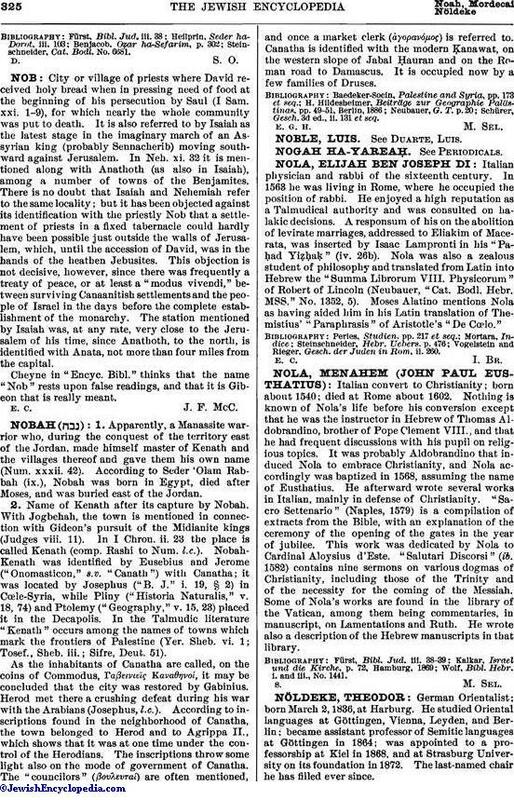 There is no doubt that Isaiah and Nehemiah refer to the same locality; but it has been objected against its identification with the priestly Nob that a settlement of priests in a fixed tabernacle could hardly have been possible just outside the walls of Jerusalem, which, until the accession of David, was in the hands of the heathen Jebusites. This objection is not decisive, however, since there was frequently a treaty of peace, or at least a "modus vivendi," between surviving Canaanitish settlements and the people of Israel in the days before the complete establishment of the monarchy. The station mentioned by Isaiah was, at any rate, very close to the Jerusalem of his time, since Anathoth, to the north, is identified with Anata, not more than four miles from the capital. Cheyne in "Encyc. Bibl." thinks that the name "Nob" rests upon false readings, and that it is Gibeon that is really meant.